The new edition (even better). "Double Impact" - so literally and figuratively be called supplement offered by the Iron Horse. It contains only effective and fully secure active substances. The maximum pump and a very successful training! 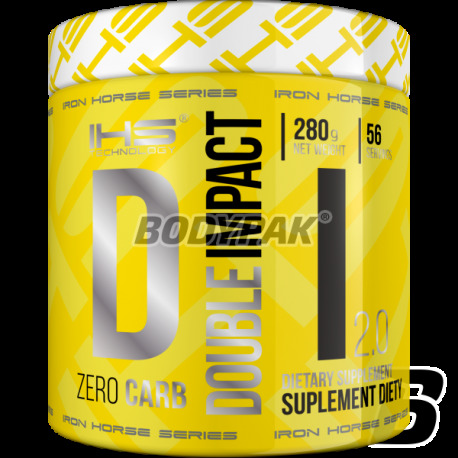 "Double Impact" - so literally and figuratively be called supplement offered by the Iron Horse. IHS DOUBLE IMPACT 2.0 will make you feel that you're alive! IHS DOUBLE IMPACT 2.0 On the contrary, this is the best composition of the active ingredients which so far created! You will no longer feel embarrassed another poor training, which leave without feeling workout performed on 100% of your opportunities! IHS DOUBLE IMPACT 2.0 also contains a blend of AAKG Citrulline Malate - a unique combination of these components leads to incredible inflation of muscle during weight training. If you were delighted appearance of their muscles after intense muscular effort, it is thanks to the company IHS'll find that they will look just as great during the day! MAXIMUM MUSCLE TENSION ALMOST THE WHOLE DAY! AAKG - require enormous muscle pump and excellent performance in training? This substance is necessary to carry out extreme efforts with the greatest weight. It is responsible for increasing the secretion of growth hormone, as well as the intensification of anabolic processes of muscle proteins. In addition, it leads to inhibition of the catabolism of training and post-training, as well as improving libido. Citrulline Malate - the use of citrulline supplementation leads to increase stamina, and improve the regenerative processes. This is a great substance used to recover energy, as well as reduce fatigue. Thanks to her workouts are extremely effective. Do you think that you had the opportunity to test their full skills? IHS DOUBLE IMPACT 2.0 will show you how you were wrong! 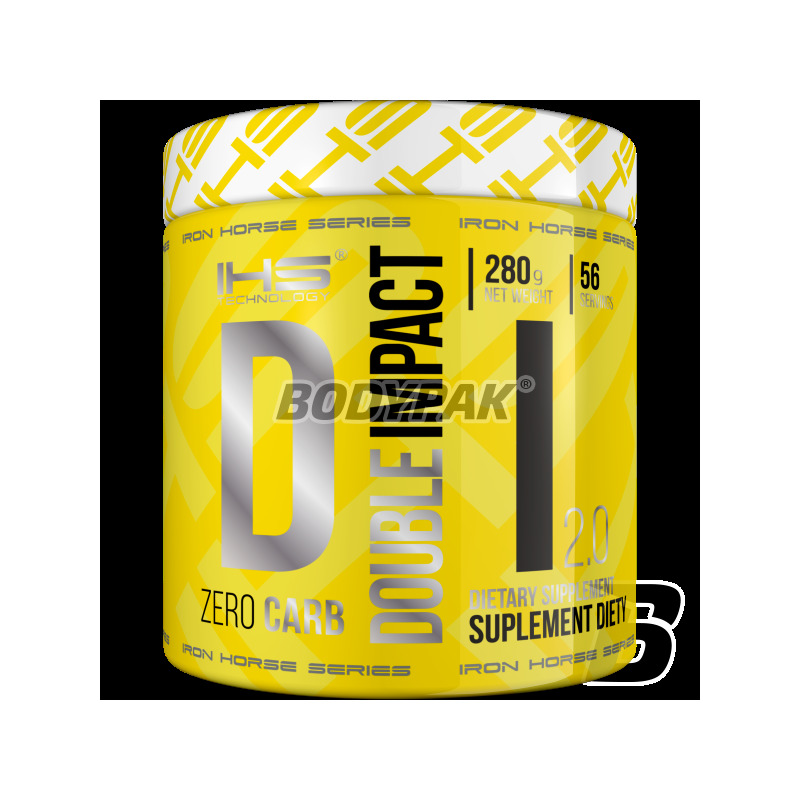 IHS DOUBLE IMPACT 2.0- TO SOMETHING MORE THAN SUPEMENT preworkout - TO RESULT FROM LONG EXPERIENCE AND ACHIEVEMENTS OF SCIENCE! It is recommended to use 1-2 servings 30 minutes before intense exercise. In order to maximize the effects, can be used daily 1 serving upon waking. Składniki: alfa-ketoglutaran argininy, jabłczan cytruliny, N-carbamoyl glutamate, chlorowodorek tiaminy, substancja słodząca (sukraloza), substancje przeciwzbrylające (stearynian magnezu, dwutlenek krzemu). AAKG i Jabłczan Cytruliny robią robotę. Na wieczornej siłce jest potężne nabicie, potem zjem i bez problemu mogę iść spać. Double Impact to solidny towar bez stymulantów. Miałem jedno pakowanie, cena średnia, ale jak będę potrzebował to kupię. Broni się jakością.